A pit bull terrier which the USPCA believes was involved in dog fighting has been seized from the home of a County Tyrone sportsman. A solicitor for Tyrone GAA player Ger Cavlan confirmed that the animal was removed from his house in Dungannon on Wednesday night. The animal charity said the dog had been tracked on flights from Finland through Frankfurt and then into Dublin. The house search was carried out by police and the USPCA. A number of other items were also seized during the operation. The USPCA said a vet had examined the male dog and found its injuries were consistent with wounds inflicted during dog fighting. The dog arrived in Dublin travelling on a pet passport, which said the dog's name was Cannonball and its owner was in Finland. 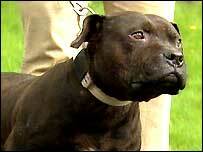 The USPCA also said documents relating to dog fighting had been found at Mr Cavlan's home. The charity's Stephen Philpot said: "We decided to seize the dog due to facial injuries it had. "Our vets have confirmed for us that this is an animal which they would class as a fighting dog under the terms of the Dangerous Dog Act. "They've also confirmed the animal has injuries to its face, throat and ears and teeth, which would suggest those injuries are consistent with a dog used in organised dog fighting." The USPCA has said they are also extremely concerned about the safety of three other pit bulls which they believe had been in the house. In a statement, Mr Cavlan's solicitor, Christopher Rafferty, said the dog did not belong to his client and he was only looking after it. He added that dog-fighting was a sport which Mr Cavlan did not condone and did not participate in. He also said Mr Cavlan had not been charged, interviewed, nor asked to comment by the police. It has been illegal to own pit bull terriers in Northern Ireland since 1976 as they are a proscribed breed under the Dangerous Dogs Act. However, it is still legal to keep the breed in the Republic of Ireland. # posted by SAOIRSE32 : 7:57 p.m.